Your camera experience will only be as enjoyable as your gear allows it to be. This extends far beyond your technical items. What do you use to carry your cameras in? If you’re smart you’ll invest in a durable and practical case such as the Lowepro ProTactic BP 250 AW backpack. This brand got it right. Lowepro doesn’t specifically design camera bags. The technology and innovation they apply to their products do make sense for a photographer’s needs. The Lowepro ProTactic BP 250 AW backpack is designed for mirrorless cameras. It could be the ideal addition to make your photography session run smoother. You may also want to check out my comparison review of the Lowepro 350 vs 450. Here’s why. The Lowepro ProTactic BP 250 AW backpack is focused on giving photographers the opportunity to catch every shot they want. This is enabled by the positioning of features and because the bag is easy to carry. You’ll enjoy using your camera all day without getting tired. Let’s look at some features you can look forward to. Lowepro is known for its backpacks that incorporate internal frame features. This makes it possible for backpacks to be carried close to the body. This close-fit feature means your camera bag won’t pull your shoulders down as some other bags do. A camera bag must fulfil various duties. Let’s look at why this bag makes practical sense. The Lowepro ProTactic BP 250 AW backpack allows you to carry your camera gear but also many more items. It means you can take one bag when you’re out on a shoot instead of lugging another personal bag as well. Lowepro designed this bag with the intent of making it easy to get ready for the shot you want. There are various bags on the side to give you easy access to parts such as lenses or the camera itself. The bag’s many features help you handle any type of photography situation. You’ll also enjoy the hip pockets where you can keep handy items you want within easy reach. The Lowepro ProTactic BP 250 AW backpack is not only for when you’re busy with a shoot. The BP 250 can be your daily carry bag for everything your lifestyle requires. This makes it an excellent bag for full-time photographers. Those who take it on as a hobby can also customize it to fit their requirements. The bag allows you to customize it according to your requirements. You know your workflow preferences; make sure you can get to items in the order you need them. This is made possible through various MaxFit dividers. These dividers help you allocate space for different pieces of gear. The laminated construction means you won’t waste space but simply use it dynamically. You can also combine your Lowepro bag with Sliplock items. These loops allow you to fix other bags to the Lowepro BP 250. This is the ideal way to ensure you can take a water bottle along during a long photography session. Now you don’t have to use the valuable space of your technical gear. Lowepro doesn’t skimp on quality. The entire bag is made from high-quality material. Your gear is also protected by the sturdy frame inside the bag. Your gear will always be safe, even in rainy conditions. You simply have to attach the Weather AW Cover. 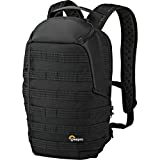 The Lowepro ProTactic BP 250 AW backpack largest opening is against your back. No one can simply open it and grab your valuables. The bag has zippers instead of Velcro. Zippers can easily scratch camera parts when you remove them from the bag. The Lowepro ProTactic BP 250 AW backpack is an excellent photography bag. It’s unfortunate that its size makes it impractical for many serious photographers. If your current collection of gear can fit inside, you’ll love the sturdy design that will protect your valuables without making your excursions uncomfortable. Let the bag take care of your camera so you can focus on capturing the perfect shot. Another backpack from Lowepro is the Lowepro 450 AW camera backpack.